This fleece bird blanket creates a protected environment that keeps your bird warm even in drafty areas or seasonal weather. Simply place in corner near perch and tie to cage. 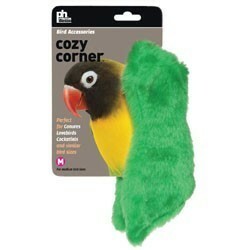 The Cozy Corner is machine washable and available in yellow, purple and green. Notify me when Med Cozy Corner-Prevue Hendryx is in stock.